FTD® proudly presents the Fall Harvest™ Cornucopia by Better Homes and Gardens®. 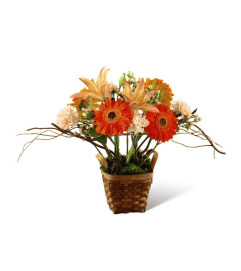 Capture the essence of the autumn season with this inspiring and colorful arrangement. 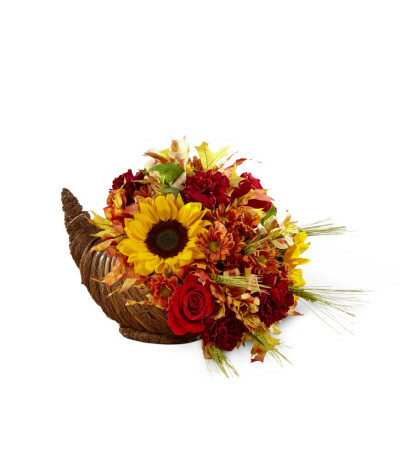 Rich red roses, bright and beautiful sunflowers, bronze daisies, yellow Peruvian Lilies, and burgundy carnations are perfectly arranged in a natural cornucopia basket that speaks of harvest traditions and treasured family gatherings with each gorgeous bloom. 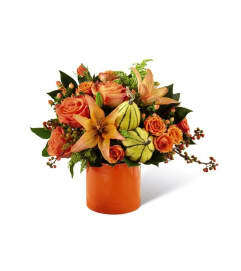 A wonderful Thanksgiving centerpiece or hostess gift!